All you need to know about the 21st Annual Congress, compiled into one report — The experts, the feedback, the audience, the scope, and this year’s agenda-at-a-glance. Take a read through and be sure to join us in 2019. Simply fill out the form on the right to download. 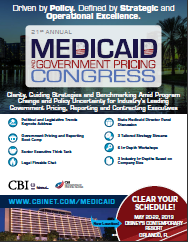 CBI is the health and life sciences industry leader in providing thought leadership, actionable data, benchmarking, case studies and regulatory information through a dynamic conference platform that facilitates innovation, collaboration and elevation across the pharmaceutical, biotechnology, medical device and healthcare industries.